Education is changing, and schools are still struggling to adapt. 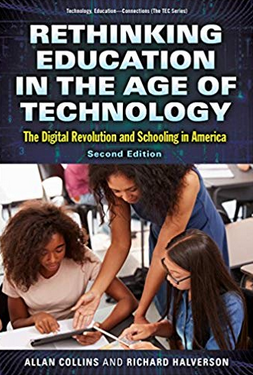 That’s the key takeaway from this interview with Rich Halverson, co-author of Rethinking Education in an Age of Technology which just came out in its second edition. First published in 2009, Halverson’s book is one on the most underlined and dog-eared of all of the books on my shelf, and after listening to this podcast, I think you’ll have a pretty good sense of why. In this podcast, we talk about the good and bad of personalized learning, the digital divide as it applies to learning opportunities, and the growing trend toward learner agency. We also discuss the what the future holds for those schools who are unable to figure out a path forward that incorporates a different vision for what education is and needs to be. A former high school teacher and administrator, Rich is currently a full-time professor in the Department of Educational Leadership and Policy Analysis at the University of Wisconsin in Madison. He’s also a Fellow at the Wisconsin Institutes for Discovery.